Okay, Binnie, Jiwonnie, wherever you are, hopefully this news can reach you. 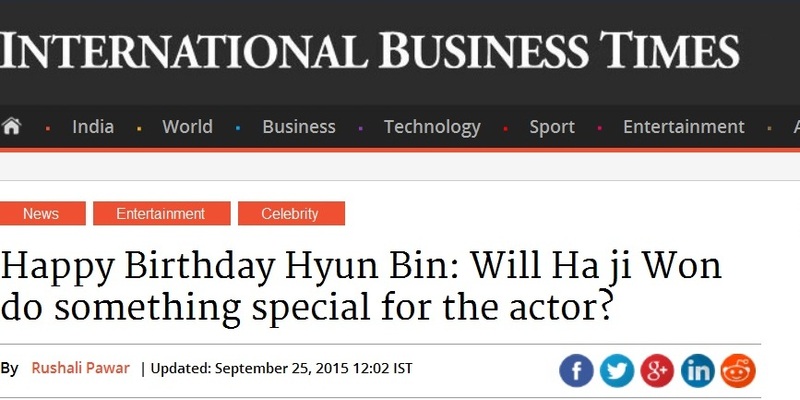 Guess what, your faithful shipper is no joke, not just us the fun-loving JB’s Angels here, but there is an interesting news floating online from a media called International Business Times, where its India edition has just wrote HAPPY BIRTHDAY HYUN BIN, WILL HA JI WON DO SOMETHING SPECIAL FOR THE ACTOR?. Yep! No kidding! The writer, Rushali Pawar, is definitely a fellow shipper like us. *high five*. Actor Hyun Bin has come a long way since his debut on KBS drama, “Bodyguard.” From being a minor character on a show, he has gone on to become one of Korea’s famous celebrities in recent years. Now, he has a slew of drama series and movies to his credit, and is planning on making his comeback soon with a film titled, “Cooperation.” According toK Drama Stars, the actor will play the role of a North Korean defector. While Hyun Bin prepares for his new role after being absent from the silver screen for two years, fans have been wondering how he would celebrate his 35th birthday. The actor, who is linked to Ha Ji Won, might have planned a special date with the star. After all, the two have shared a wonderful chemistry on camera when they starred on the drama show, “Secret Garden.” In fact, the actress once said that she is closest to Hyun Bin among all the male actors in the industry, reportedSoompi. Although both of them haven’t confirmed their relationship, fans of the two hope that Hyun Bin and Ha Ji Won would become a couple one day and even get married. hahaha… like this much…. ear to ear smile here… thanks for the update…. more please..
Hahaha….let’s hope for that 😀 And thanks for the support Dear <3.